The ValueJet VJ-1638UH is Mutoh’s first ever dual head LED UV printer delivering increased print & cure performance. 162.5 cm (64”) wide, the VJ-1638UH is all about versatility; it is the ideal tool to expand your business with a wide range of commercial print applications. The printer accommodates 1625 mm (63.97”) roll media up to 30 kg as well as rigid boards up to 1625 mm x 1200 mm (63,97” x 47,24”) up to 15 mm thick and up to 15 kg. 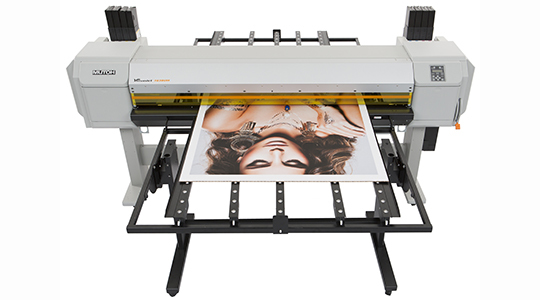 For automatic roll up of prints, the VJ-1638UH can be equipped with a 30 kg, 80 kg or 100 kg motorised take-up system. This printer will enable you to maximise your creativity! Next to CMYK, the VJ-1638UH also can be set-up with varnish and white to handle transparent or non-white substrates without losing colour power or to create special print effects and multi-layer printing for prints with high added value.